Pulwama attack 2019, was about Jammu and Kashmir terror attack on CRPF by terrorist. A suicide bombing attack on a CRPF convoy in Pulwama attack region of Jammu and Kashmir killed 40 CRPF’s on 14th Feb 2019. The rally was initiated by Shri. K C Jagannath Reddy,Secretary, CMR Jnanadhara Trust, Dr. M P Hrishikesh, Director CMR Center for Business Studies along with the Faculties and students of CMR. All of us joined hands on 20th Feb 2019 at 5 PM for a candle light march to pay tribute to the brave soldiers of our country who sacrificed their lives for the sake of the nation. Let’s all pray for the soldiers to rest in peace and also to protect their families. Hence this rally is a tribute to all the CRPF jawans who were martyred in the Pulwama attack. 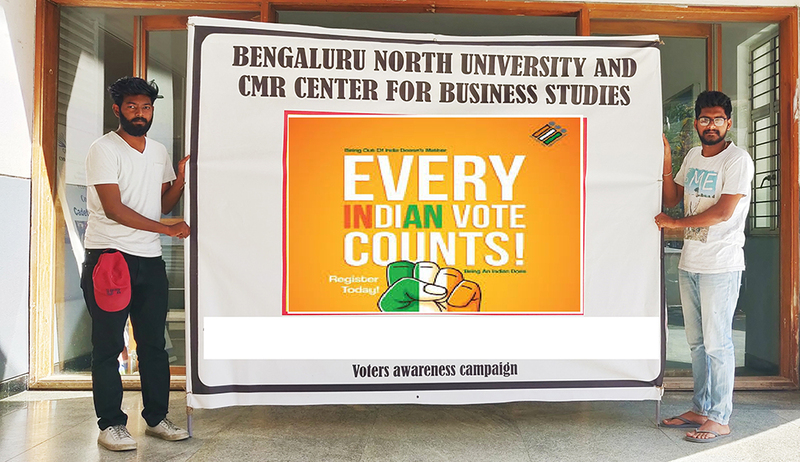 Voter awareness programme was undertaken by the students of CMRCBS in collaboration with Bengaluru North University with a Candle light March.